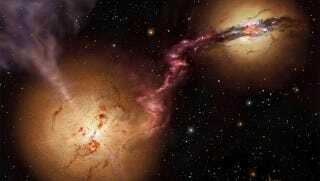 What happens when two black holes are smashed together? We've never seen it happen, but a collision with two black holes would be one of the most dramatic events in the entire universe, releasing so much energy that we could detect it clear across the cosmos. You can check out Sixty Symbols for more great videos.